I would like to introduce this HYBRID mod to you, please check! 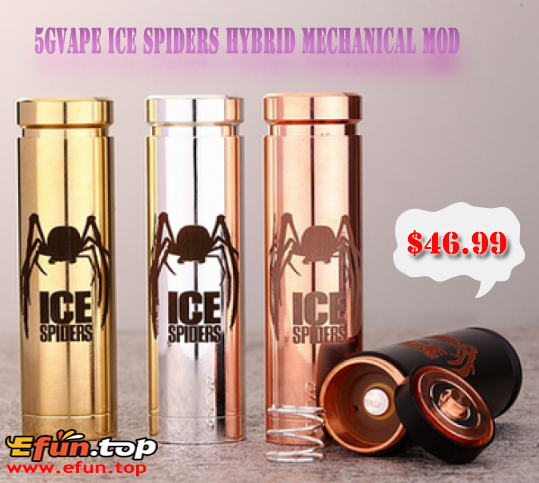 5GVape Ice Spiders features 26mm tube with 24mm top cap, nice carving spider pattern, silver plated copper contact pin and single 18650 / 20700 battery compatible (battery not included). With hidden venting holes and PEEK insulation, it is safer to use this mech mod. Each mod has a serial number (18650 top and 20700 top cap has the same serial number).Please remember to get it for$46.99. XMAS SALE 30% Off Discount For You, Catch The Chance To Get It!